When the average database developer is obliged to manipulate XML, either shredding it into relational format, or creating it from SQL, it is often done 'at arms length'. A shame, since effective use of techniques that go beyond the basics can save much code, and are likely to perform better. It often becomes necessary to create, shred, combine, or otherwise reconstitute XML data, in order to make it fit a specific purpose. Sometimes business requirements dictate that XML fragments should be merged, while other requests call for XML documents or fields to be shredded and their values imported into tables. Sometimes, XML Data must be created directly from existing tables. SQL Server provides plenty of XML-related tools, but how can we know which ones to use, and when? 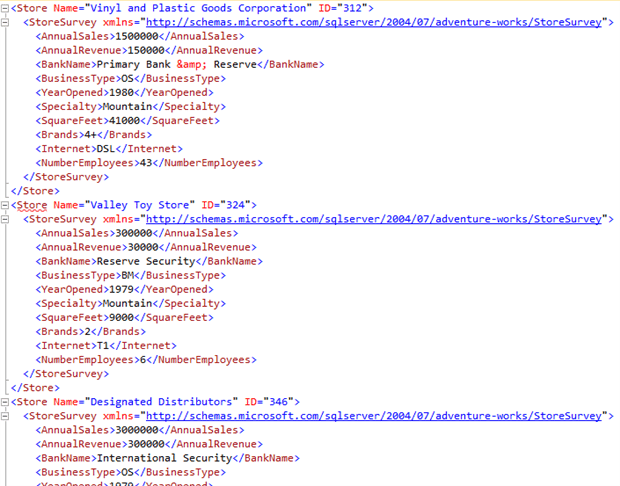 Let’s examine some of these tasks that require XML manipulation, using the sample AdventureWorks2012 database (Other AdventureWorks versions should work OK, but there may be variations in the data and/or table schemas). We need to include the BusinessEntityID field and some of the name-data columns in the new XML structure. Note that there happens to be an existing XML column in the table – the Demographics field. 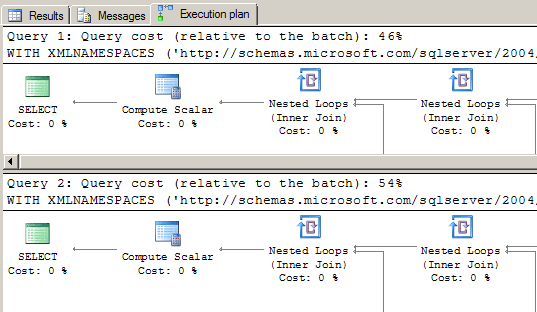 SQL Server provides an XML option to use with the FOR clause, allowing for an easy method of converting table data into XML nodes. FOR XML can take different arguments – let’s find out which one works for us. The ELEMENTS argument causes every value to be created as a node element. Now we have a separate node for every value, and a wrapper root node. In the first example the resulting XML had the same data, but the values were rendered as attributes. Using the PATH argument has enabled us to specify the name ‘Person’ in our root wrapper. What happens if we add the XML field (Demographics) to our SELECT clause? We see that an existing XML field is created as a nested node element. Note that the XML namespace data is included in the nested node. ‘Shredding’ XML data is another common request. To ‘shred’ means to strip the actual data away from the markup tags, and organize it into a relational format. For example, shredding is what happens when an XML document is imported into a table, when each node value is mapped to a specific field in the table. A popular method to use for this is to use the OPENXML() function, but XQuery methods can also be engaged to perform the same tasks. OPENXML() was available to use for shredding before the SQL Server XQuery methods were introduced, and is somewhat faster for larger data operations. However, it is decidedly more complex to use, and is more memory intensive. Also, OPENXML() cannot take advantage of XML indexes as XQuery methods can. We’ve received another request: pull data from some of the nodes (Occupation, Education, HomeOwnerFlag, NumberCarsOwned) that are contained in the Person.Person table’s Demographics XML column for BusinessEntityID 15291, and display it along with other non-XML field values (FirstName, MiddleName, LastName) from the table. We’ve used the nodes() method to drill down (one level) to the location of the ‘IndividualSurvey‘ node, and then returned the actual values via the XQuery value() method. We used CROSS APPLY to join the node set back to the table. A CROSS APPLY would not have been necessary if we were shredding an XML variable, instead of from an XML column in a table. The nodes() method easily shreds XML data from XML columns as well as from XML variables. The nodes() method requires table and column aliases (T(C)) in order for other XQuery methods (like the value() method) to access the node set that the nodes() method returns. The column and table alias names are irrelevant. Notice that we’ve used a WITH XML NAMESPACES clause to declare the XML namespace. Declaring the namespace is necessary because the Demographics XML structure uses typed XML – its XML data is associated with an XML schema. Now that our XML data has been shredded, the results can be stored in a table or combined with other queries. In light of this, why use the nodes() method at all? For simple queries, it’s probably better not to use it, although the batch cost or query time differences may be negligible. We’ve shown the use of nodes() in a very basic example, but it can also be used in more complex queries where it is necessary to return subsets of node sets – using nodes() on a nodes() result. It’s also very convenient to use for constructing new XML from existing nodes. Since nodes() works by rendering logical portions of XML instances as node sets, it’s ideal for when query results must be returned in node form. Another, perhaps more uncommon procedure, would be to merge XML data from different instances. 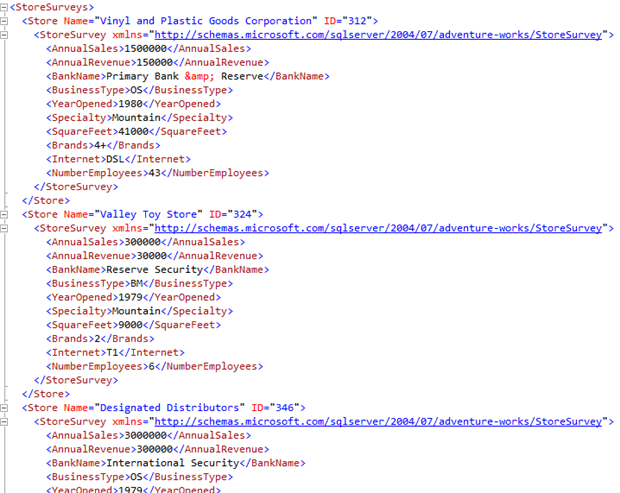 Let’s do just that to demonstrate – we’ll combine all of the store survey data from the Sales.Store table into one XML structure, for SalesPersonID 282. 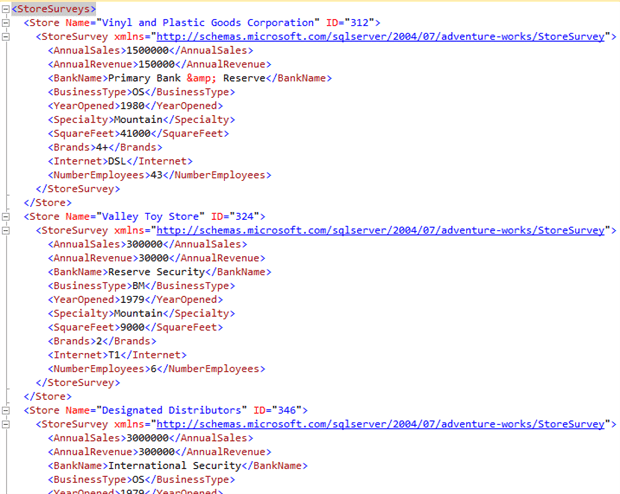 The store survey data is in the Demographics XML column. We also want to include 2 non-XML fields for each store: Name and BusinessEntityID, as node attributes in a parent ‘Store‘ node. To complete the process, we’ll wrap the final XML structure with a ‘StoreSurveys‘ root node. The addition of the ROOT argument gives us the top-level wrapper node we wanted, merging all store survey records for the sales person into one XML instance with a root node. The above script uses the Child axis to drill down one level further than the nodes() method’s node set, thereby eliminating the need to reference the ‘StoreSurvey‘ node directly. 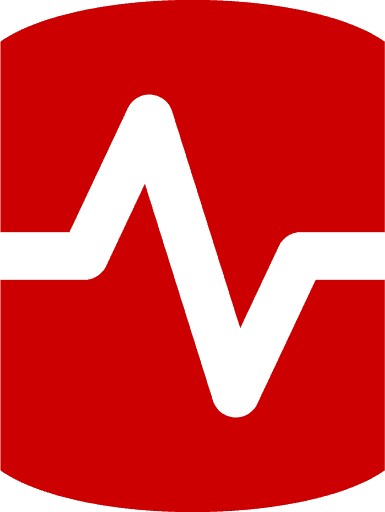 We’ve taken a look at some ways to coerce XML data to fit specific needs. We handled one common request, creating XML instances from existing tables, by using the FOR XML clause – applying appropriate arguments to design the XML structure to fit specific aesthetic requirements. We demonstrated another very common procedure, shredding XML data, by employing the XQuery nodes() method. We saw that multiple XML fragments and instances can also be merged into a single instance by using the FOR XML tools. We then reversed that operation by splitting the XML instance into logical records of XML data. Manipulating XML data to fit your needs may take creativity and some experimentation with new tools. We’ve worked out solutions for a few basic problems, but there is more to learn. The techniques that we have introduced here should help to get you started. Seth Delconte is a SQL Server Developer. In addition to SQL Server database development and administration, he enjoys C#.NET and Linux development. How to shred children nodes? This is a great article and I learned a lot from you. Thanks for sharing. I have a challenge shredding child nodes and I hope you can shred some light. I added a FamilyInformation and Education child nodes from your same XML. How can I shred the child nodes elements like TotalChildren, MarriedDate, Highschool, MiddleSchool information from XQuery? Excellent article. I wish I’d found it six-odd months ago when I was starting on the current project. We need to communicate with an external system using XML messages stored on the file system. I eventually managed to work out how to generate the XML I needed but was completely defeated by the problem of how to get this data out into a file. All the mechanisms I could find (I’m still pretty much a T-SQL newbie now, I was a complete virgin back then) seemed to require a text variable type that was limited to 8000 characters or so, and XML can outgrow that very easily if you turn your back. The only mechanism I could find to get data from a T-SQL variable of type XML out onto the file system was to use an SSIS package, feed the variable to an XSLT transform that did practically nothing, then and specify output to a file. Unfortunately it took me too long to work this out so the project went ahead using "arms length" methods. I have stored a "flat" resultset as XML in an XML column and now I need to query the XML and return the original resultset. At runtime when extracting the XML back into resultset, I don’t have access to the original resultset’s structure, only the XML representation. Is there a simple syntax to query an unknown XML structure from an XML columns and return a resultset? In Sql, it is "select *". Seems like it should be fairly simple when XML is the source, but I have not yet found it to be simple. Thanks for the reply delcons. I hadn’t thought about the relational nesting problem, but I can see your point. I did find about 300 lines of code on sql server central dot com that is a very recent (as of 10/2012) attempt to make such an XML shredder. It seems to work great but I don’t dare deploy it to production because I have no clue how or why the damn thing works! As an alternative, we’ve decided to generate the query syntax to shred the XML dynamically, at the same time we convert the recordset to XML, and save both together in the record. Because of course at that time we do have access to the original table structure, so we know what the XML structure is. But its kind of a new concept for me- saving the data structure along with the data in every record. I thought that was what XML was supposed to prevent the need for! Just curious, Ken… Was the 300 line auto-xml shredder the one I posted? I was looking for something else having to do with XML and ran into this fine article. Thought I’d stop long enough to read it and take my hat off to you for such a fine article. Well done, Seth! Thank you for such a clear concise and practical introduction to using xml in Sql Server, this post made me wonder whether there is a better method than this one (1) to explicitly name the column generated by the third sql script you posted. I feel like after reading these two articles, I am ready to do anything with XML in SQL Server, thank you Seth. This is also great if people want to more a bit more about XML. Is it possible to generate ? XML type and performance ? I need help to parse XML in SQL Server. I need to get “d1p1:Val2” value and concatenation of values for “d2p1:string”.